TOTAL SAFETY SIGNS is pleased to provide this web site for your personal use. However, by using this site, you agree to the terms and conditions provided below. This site is provided for your personal non commercial use. You may not copy material from this site for commercial use. You may copy material in limited quantities from this site for your personal non commercial use provided that our copyright notice is affixed to the copied material. TOTAL SAFETY SIGNS reserves the right to terminate at any time your permission to make personal copies of material from this site. You are prohibited from using this site to post or transmit any unlawful, threatening, libellous, defamatory, obscene, scandalous, inflammatory, pornographic, or profane material or any material that could constitute or encourage unlawful conduct. TOTAL SAFETY SIGNS may from time to time monitor or review material transmitted or posted using this site and reserves the right to delete any material the company deems inappropriate. TOTAL SAFETY SIGNS is under no obligation to do so and assumes no responsibility or liability arising from any material transmitted or posted using this site. 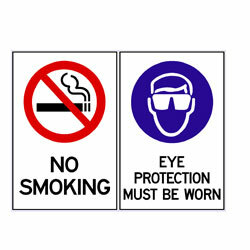 TOTAL SAFETY SIGNS strives to provide accurate and up-to-date material on this site. However, TOTAL SAFETY SIGNS makes no warranties or representations as to the accuracy or timeliness of the material provided on this site. 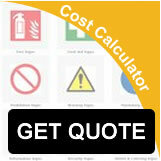 TOTAL SAFETY SIGNS assumes no liability or responsibility for any errors or omissions on this site. Neither TOTAL SAFETY SIGNS, any of its agents, nor any other party involved in creating, producing, or delivering this site is liable for any direct, incidental, consequential, indirect, or punitive damages arising out of your access to, or use of, this site or any material from this site. Without limiting the foregoing, this site and the material provided on this site are provided "AS IS" WITHOUT WARRANTY OF ANY KIND EITHER EXPRESSED OR IMPLIED, INCLUDING BUT NOT LIMITED TO, THE IMPLIED WARRANTIES OF MERCHANTABILITY, FITNESS FOR A PARTICULAR PURPOSE, OR NON INFRINGEMENT. Some jurisdictions may not allow the exclusion of implied warranties, so this statement may not apply to you. TOTAL SAFETY SIGNS assumes no liability or responsibility for any damage to you, your computer, or your other property, due to your access to, use of, or downloading of this site or any materials provided on this site. TOTAL SAFETY SIGNS has not reviewed any or all of the sites linked to this site and is not responsible for any sites linked to this site. Your linking to any sites from this site is at your own risk. By linking to a site or permitting a link to this site, TOTAL SAFETY SIGNS does not endorse the site operator or the content of the linked site. Unless otherwise specified, this site and material provided on this site are solely for promoting products, programs, and business operations within Australia. Any dispute arising out of your use of this site or material from this site shall be resolved according to the laws of the State of New South Wales, Australia. TOTAL SAFETY SIGNS may modify these terms and conditions at any time and without notice.